Dear World: Bill And Melinda Gates Have 'Big Bets' For 2030 : Goats and Soda Their annual letter to the public has been published. They're betting that in 15 years, polio will be eradicated, Africa will feed itself and 2 billion people will use their phones as mobile banks. 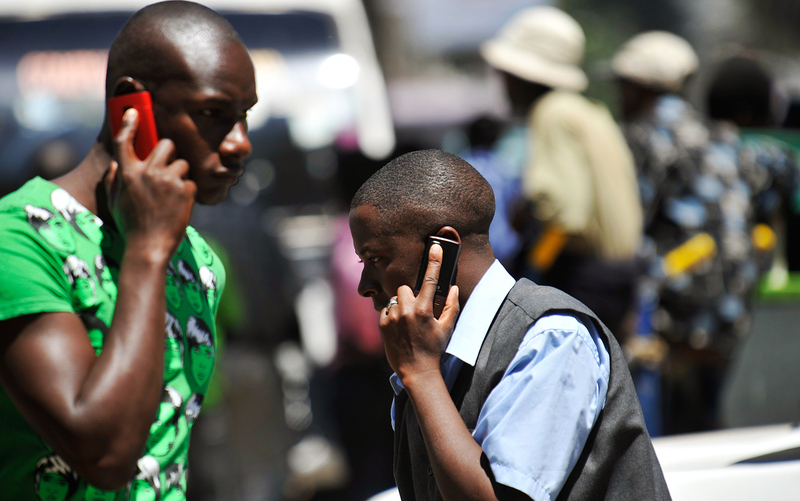 Cellphones are everywhere in the developing world, as this Nairobi street scene shows. Bill and Melinda Gates believe the phones can be used for everything from farmer education to instant banking. The challenges they face as they craft the letter is clear: How do you talk about diseases and development in a way that's going to grab eyeballs? And how do you stress the progress that has been made but also emphasize the tremendous amount of work that lies ahead? And the big global problems that the Gates Foundation is tackling have always been the same— wiping out diseases, reducing poverty, improving education. So each year, the letter has a slightly different theme. This year's hook: "Our big bet for the future." The letter looks back 15 years in the past: "We started our foundation in 2000 with the idea that by backing innovative work in health and education, we could help dramatically reduce inequity." And it looks 15 years into the future, predicting that "the lives of people in poor countries will improve faster in the next 15 years than at any other time in history." Not so surprisingly, Bill Gates's love of technology comes into play. The 2015 letter focuses on the transformative role cellphones can play in the developing world: delivering information to remote farmers and providing banking services to the poor. The letter also hints that Bill Gates may have something in the works, independent of the foundation, to develop cheaper energy sources. At the end of the letter, Bill and Melinda Gates urge people to become "global citizens" and to make themselves aware of problems that don't always get media spotlight: "You take a few minutes once in a while to learn about the lives of people who are worse off than you are." But it's one thing to get people to devote a few minutes to global causes. How do you turn that into sustained involvement? Appearing on The Tonight Show Starring Jimmy Fallon to talk about the letter, Bill Gates said, "It would be great if we could create a viral video." Then came a 33-second clip of Gates, in funny glasses, wigs and hats — and even holding up a giant lollipop — endlessly repeating "Gatesletter.com." And yes, the video has gone viral. At last count, YouTube showed 1.7 million views.